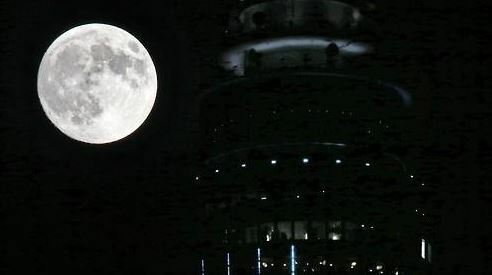 The biggest supermoon of this year is set to brighten up Seoul sky around midnight on Sunday, a state-run maritime research agency said Wednesday. According to Korea Astronomy and Space Science Institute, the best time to see the astronomical event is 0:47 a.m. on Monday, when the moon will appear at its largest for skygazers in Seoul. The supermoon phenomenon will be observed at different times across the earth. The upcoming lunar show will mark the fourth occasion and the largest scale this year, following the past showings in April, May and June. A supermoon is a full moon or a new moon that coincides with the closest distance that the Moon reaches to Earth in its orbit. The distance between the Moon and the Earth around midnight on Sunday will be at 357,623 kilometers.